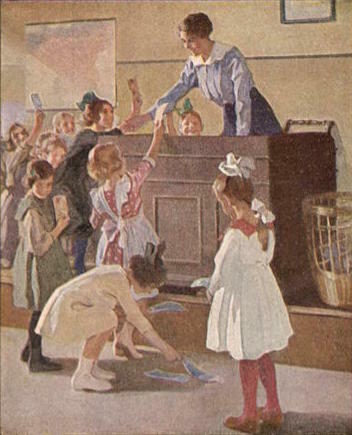 Many of the women in Isabella Alden’s books had to earn a living to support themselves or their families. That was the case with Maria Randolph in Household Puzzles, who took in laundry so she could buy medicine for her father and pay the family’s bills. 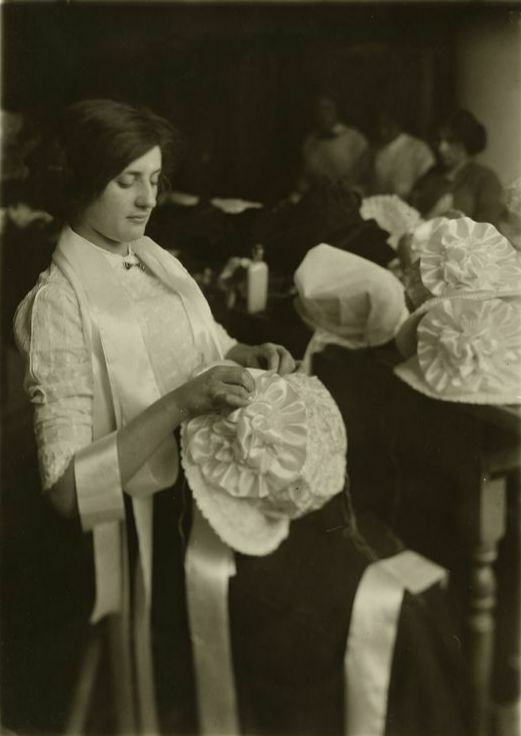 And in Miss Dee Dunmore Bryant, Mrs. Bryant supported her children by sewing late into the night, when she wasn’t working long hours at the local canning factory. 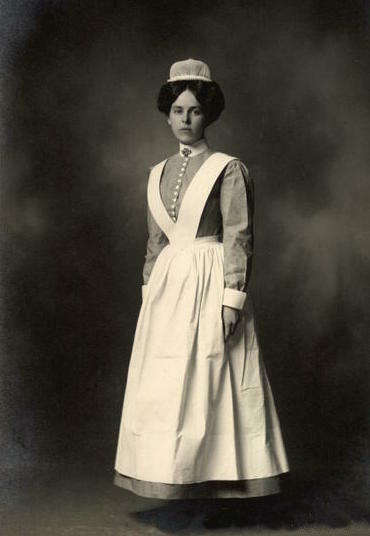 Earning a living wage wasn’t an easy thing for women to do in the years between 1880 and 1920. Competition for jobs was fierce, as more and more women entered the job market and took over low-paying, repetitive jobs that men once held—and they earned considerably less than men did for performing the same work. 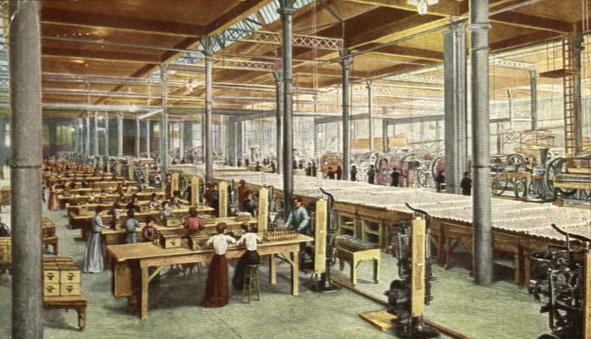 The majority of jobs open to women were manual factory work and service employment. Both were physically demanding. If a woman was lucky enough to find a position, she could count on working long hours in often poor conditions. In factories there were few breaks in the long work day. Employers commonly boarded up windows to keep employees from being distracted; and they blocked doors to discourage workers from leaving their posts before the workday was done. Those were some of the conditions that lead to one of the worst work-place disasters in American history: the 1911 Triangle shirtwaist fire. 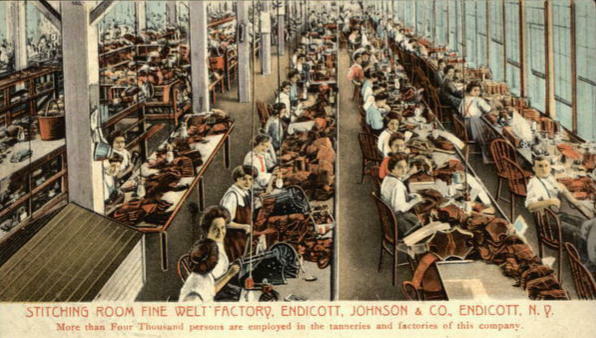 A New York clothing manufacturer, The Triangle Waist Company, locked its workers inside their assigned work areas so they couldn’t leave. 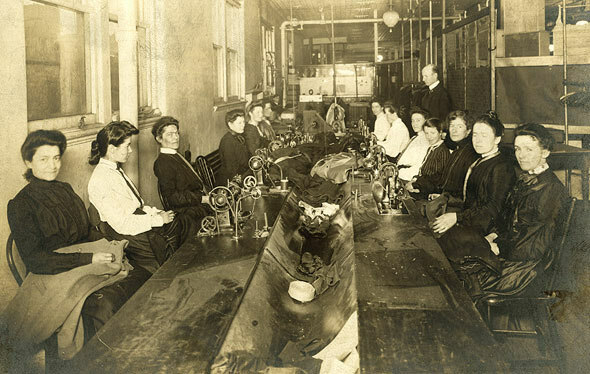 Most of the workers were young women and girls as young as fourteen. When a fire broke out, their only means of evacuation was a dilapidated fire escape that collapsed under the weight of the first few workers who scrambled to safety. Click on the image to view a pdf of the full page. The fire took a horrific toll: 147 people burned to death or died as a result of jumping or falling from the upper floors of the burning building. Work in private service had its own set of challenges. 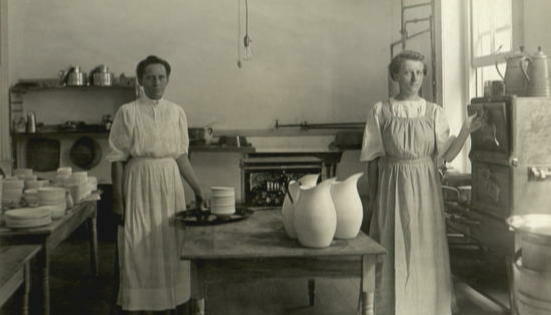 Women worked long hours as house maids, cooks, and charwomen (women who clean other women’s houses). Cooks in the kitchen of a private home. She had always taken the position that no self-respecting young woman need fear being treated other than respectfully by men; that girls probably had themselves to thank for carelessness when any man attempted familiarity. Yet the only excuse that she had given Mr. Emerson was the fact that she had chosen to make herself useful, on occasion, in his mother’s kitchen, and accept payment in money. This, it seemed, not only shut her out from Mrs. Emerson’s parlor as a caller, which she had expected, but made the son feel privileged to call her “Ellen” and treat her with a familiarity that could have been justified only by long and intimate acquaintance. She felt that such a state of things was a disgrace to American civilization. For a woman who was lucky enough—and had the financial means—to afford an education, she could go to school and be trained to work in a more skilled capacity as a teacher or nurse. But that kind of training cost money. 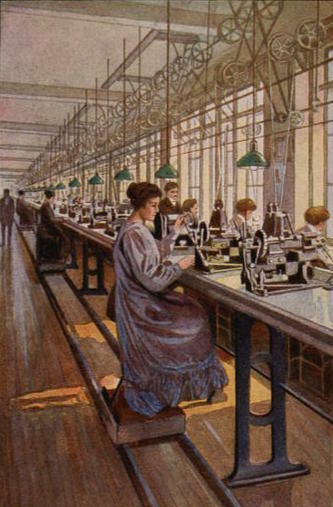 Women who had to support themselves and their families often took whatever work they could get, leaving them at the mercy of their employers’ whims and wage structures. As Constance Curtiss discovered in Pauline, she had to put up with long hours and some embarrassing mistreatment if she wanted to keep her job. She meant to be brave and true, and to demonstrate that the religion of Jesus Christ was of sufficient strength to bear any weight; but in order to do this she need not accept the attentions and take pleasure in the scenes that other women of her age would naturally accept and enjoy. God did not ask this of her; she was thankful that she felt sure of it. 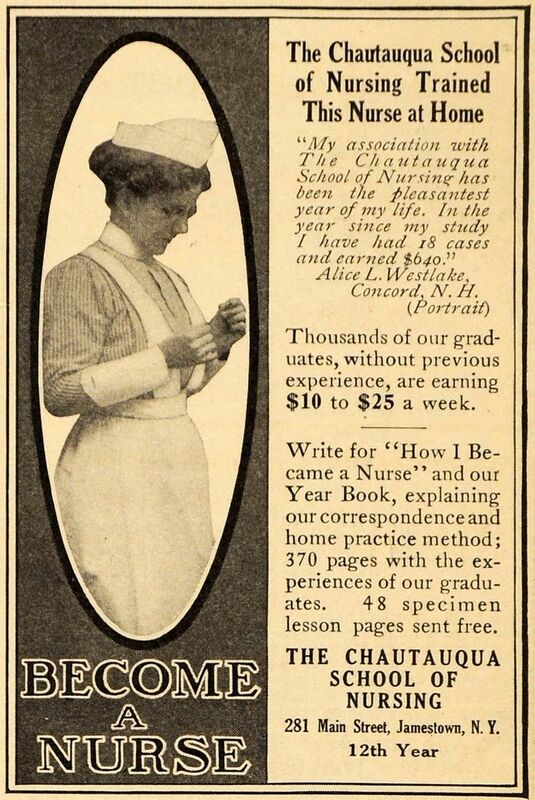 How, then, was she to ward off such attention? On her knees that night she gave herself solemnly to the work; and the sense of humiliation that Henry Emerson’s treatment of her had induced, passed. It had come to her that she might in this way have been permitted a glimpse of his true character for a purpose. Constance’s prayers were answered. With patience and God’s help, she found a solution to the dilemma of her employer’s son, and in the process, she became God’s agent in saving a young soul. Click on the book covers to read more about Isabella’s books mentioned in this post.